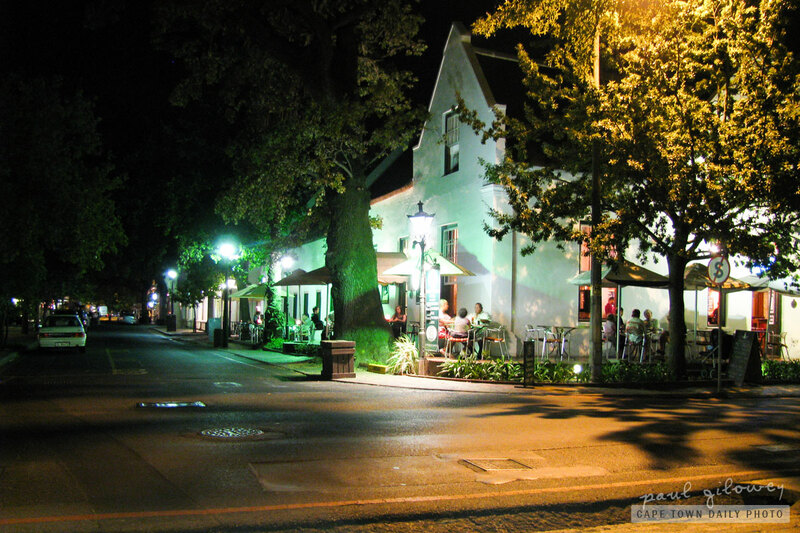 Jan Cats is the bistro and bar at the old Stellenbosch Hotel, on the corner of Dorp Street and Andringa Road in Stellenbosch (map). The restaurant was fairly quiet - I suspect because most of the the university students are away on holiday. They had a fairly large selection of meals to choose from and a number of special offers, including 40% off chicken and beef burgers. The food wasn't anything extraordinary, but perfectly acceptable (although, we'd recommend chicken over the beef patties). The day had been pretty warm, so what was great about the restaurant was that we were able to sit outside on the cool patio amidst huge oak trees, enjoying the peaceful evening atmosphere. If it's a warm evening, and you're in the mood for pub/bistro-type food, and if there's place out on the patio - I'd recommend visiting Jan Cats. If you can't sit on the patio - I'd probably select another restaurant in Andringa Road. Posted in Activities and tagged night, restaurant, review, stellenbosch on Sunday, 9 January, 2011 by Paul.